Eli & Zach: One-Month-To-Go Party! This past Saturday, my friends and I hosted a One-Month-To-Go party for a few of our besties who are getting hitched in (you guessed it!) a month! Once again, I took the opportunity to do what I heart the most, love on my friend and do crafts. The following are a few design elements I created for E+Z. All products here can be recreated and personalized for your event! Though the cupcakes were bought from Wegman’s, I made “watermelon” rice krispie treats to enhance the Picnic theme with a sugary treat! Custom-made Mason jars for party-goers. Useful for keeping an eye on your own glass, reducing waste, and having an unique favor to take home! Personalized Out-of-Town/Welcome gable boxes for Jen & David’s wedding. Boxes included welcome letter (scroll) and goodies for guests’ stay over the wedding weekend. 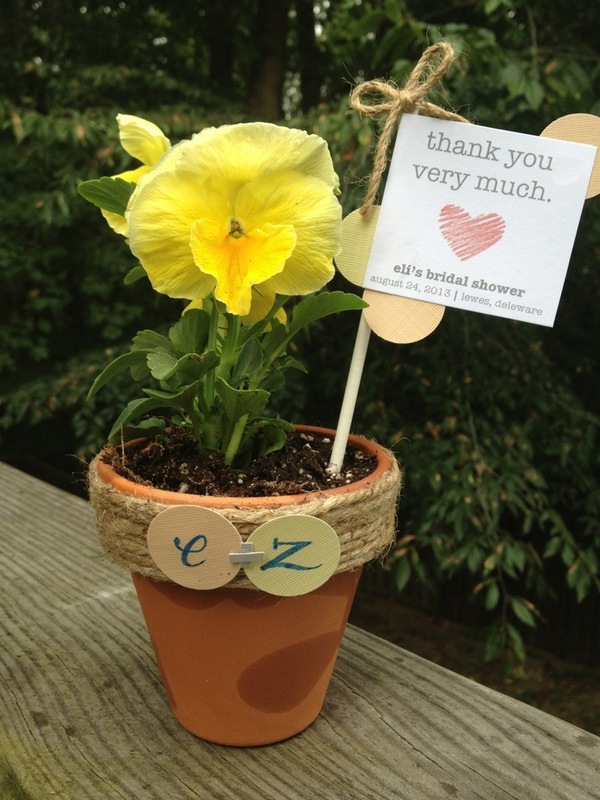 I recently had the pleasure and honor of creating a personalized favor for one of my best friend’s bridal showers. Due to the couple’s love of the outdoors, and with input from her bridal party, we decided on a re-plant-able flower in a customized clay pot.